My heart swells with pride for my hometown of Baltimore, MD. Cycling Ladies (and Lady-lovers) gathered this past friday for the regularly scheduled Baltimore Bike Party; a ride on the last Friday of every month. Lovely Ladies (and handsome Lady-lovers), peaceful evening streets, and an experience of Charm City few ever experience. And last week’s ride, in celebration of the blue moon, drew over 700 riders; the highest attendance to date! I didn’t plan to write one of those “Best. Time. Ever.” posts. But I’ve never seen so many people riding bicycles and smiling as I did at Friday night’s most recent iteration of the Baltimore Bike Party — the last Friday of each month group pedal around town. Big smiles, too. 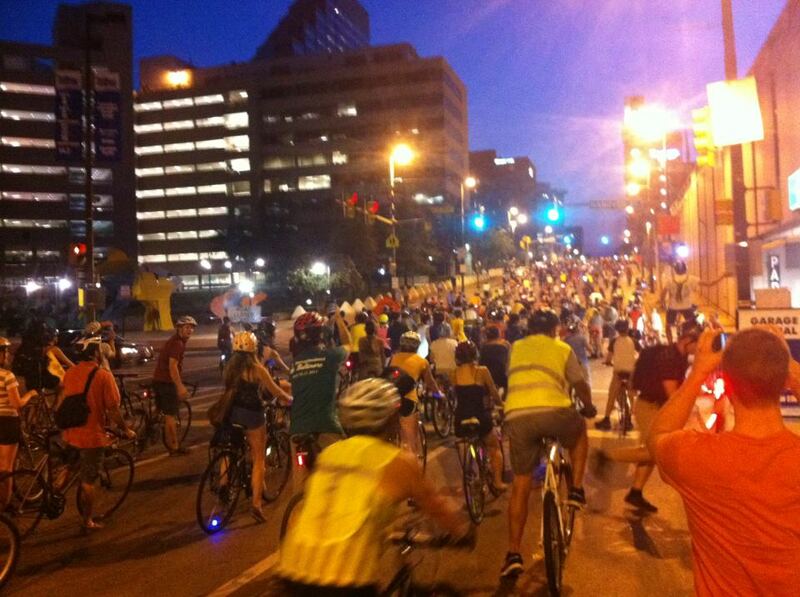 More than 700 bicyclists, surpassing all expectations, rolled out together from Mt. Vernon’s Washington Monument for the “Moonlight Madness”-themed ride, a 12-13 mile trek through East Baltimore, West Baltimore, Druid Hill Park, Hampden and other neighborhoods. It wrapped up about 10 p.m. with an outdoor party at the Wyman Park Dell: Buscia’s Kitchen and IcedGems food trucks, Natty Both on tap, music and dancing. Whole night could not have been better — check the comments on the event’s Facebook page. (The above photo, I took, the rest are courtesy of the event’s Facebook page. The ride was organized, traffic-friendly (with assistance from Baltimore’s finest), non-confrontational, and yet, blocks-long, had the feeling of an impromptu parade with bikes decorated with glow sticks, strobe lights and disco balls. And it was noisy, too, horns, bicycle bells, cowbells — and something that made a moose call — at least, that’s my best guess. Tim Barnett, one of the ride organizers, pulled a sound system in a trailer behind his bike as well, blasting everything from Ozzy to Kanye. Participants ranged from 15-50. Best part, hands down, was the reaction in the neighborhoods. People came off their porches to high-five bicyclists. Young kids sprinted and roller-skated on sidewalks to keep pace. Older kids jumped on their bikes and joined in. Absolutely lovely! Connecting the community and spreading happiness. Bikes are revolutionary not only to transit, but to neighborhood cohesiveness. All my fellow Lady (and Lady-lover) Baltimoreans, and Baltimoreans at heart: keep riding, smiling, high-fiveing, and spreading the joy of life atop two wheels!